1. 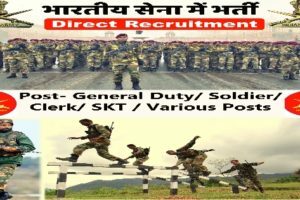 Assam Rifles Rally Bharti Tech/Non Tech 2019/Sports Quota: 10th/Metric/High School/12th pass male and female candidates who wish to join Assam Rifles as technical/non technical/ sportsman for the post of Rifleman General Duty under Sports Quota Recruitment 2019-2020. 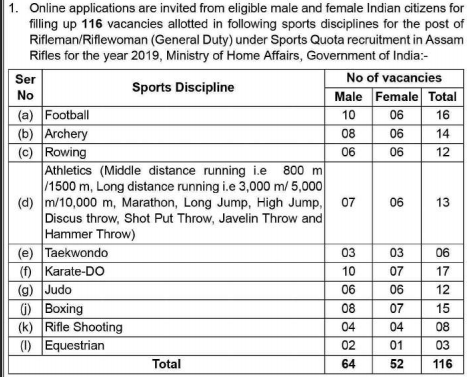 Assam Rifles Sportsman Bharti date of online application, may apply for the same as per details given below. (d) Bachelor’s Degree of a recognised University with Hindi and English as compulsory elective subjects or either of two as medium of examination and the other as compulsory / elective subject, plus a recognised diploma / certificate course in translation from Hindi to English and vice-versa or two years’ experience of translation work from Hindi to English and vice-versa in Central / State Government offices, including a Government of India undertaking. Age limit – 21-28 Years. (a) Matric or equivalent from a recognised Board or University. (b) Diploma in civil engineering from a recognised institution for Building and Road, Age Limit – 18-23 Years. (c) Must have working knowledge of Hindi, Age Limit -18-25 Years. (a) Intermediate or Senior Secondary School Certificate (10+2) examination from recognized Board/University or equivalent. (b) Skill Test Norms on Computer. English typing with minimum speed of 35 words per minute on computer OR Hindi typing with minimum speed of 30 words per minute on computer (35 w.p.m in English and 30 w.p.m. Hindi corresponding to 10500 KDPH in English / 9000 KDPH in Hindi with average of 5 key depressions for each word on computer). Age Limit – 18-25 Years. (a) Intermediate or Senior Secondary School Certificate (10+2) examination from recognized Board or University or equivalent. (b) Skill Test Norms on Computer: (i) Dictation. 10 minutes @ 80 words per minute. (ii) Transcription Time. 50 minutes in English or 65 minutes in Hindi on computer, Age Limit 18-25 Years. 6. Trade – Electrical Fitter Signal (For Male candidates only), Initial Rank – Rifleman, Education Qualification – 10th class pass with Science, Math and English as subjects from a recognised Board., Age Limit – 18-23 Years. 7. Trade – Lineman Field (For Male candidates only) , Initial Rank – Rifleman, Education Qualification – 10th class pass from a recognised Board with Industrial Training Institute certificate in Electrician trade from a recognised Institute. Age Limit – 18-23 Years. (b) 12th Standard or Intermediate or equivalent with aggregate marks of fifty percent with Physics, Chemistry and Mathematics from a recognised Board or University or Institution, Age Limit – 18-23 Years. 9. Trade – Armourer (For Male candidates only), Initial Rank – Rifleman, Education Qualification – 10th class pass from a recognised Board, Age Limit – 18-23 Years. 10. Trade – Vehicle Mechanic (For Male candidates only), Initial Rank – Rifleman, Education Qualification – 10th class passed from a recognised Board with Diploma / Industrial Training Institute certificate from recognised Institution, Age Limit – 18-23 Years. 13. Trade – Surveyor (For Male candidates only), Initial Rank – Havildar, Education Qualification – 10th class pass from a recognised Board and Industrial Training Institute certificate in Surveyor trade from a recognised Institute. Age Limit – 20-28 Years. 14. Trade – Upholster (For Male candidates only), Initial Rank – Rifleman, Education Qualification – 10th class pass from a recognised Board and Industrial Training Institute certificate in Upholster from a recognised institute. Age Limit – 18-23 Years. 15. Trade – Electrician (For Male candidates only) Initial Rank – Rifleman, Education Qualification – 10th pass and possess Industrial Training Institute certificate in the grade. Age Limit – 18-23 Years. 16. Trade – Blacksmith (For Male candidates only) Initial Rank – Rifleman, Education Qualification – 10th class pass from a recognised Board. Age Limit – 18-23 Years. 17. Trade – Plumber (For Male candidates only), Initial Rank – Rifleman, Education Qualification – 10th class pass from a recognised Board with Industrial Training Institute certificate in Plumber trade from a recognised Institute. Age Limit – 18-23 Years. 18. Trade – Nursing Assistant (For Male candidates only) Initial Rank – Rifleman, Education Qualification – 10th class pass with English, Mathematics and Science with Biology as subjects from a recognised Board. Age Limit – 18-23 Years. 19. Trade – Operation Theatre Technician (For Male candidates only), Initial Rank – Warrant Officer, Education Qualification – 10+2 passed with diploma in operation theatre technician from a recognised board or university. Age Limit – 18-23 Years. 20. Trade – Physio Therapist (For Male candidates only) Initial Rank – Warrant Officer, Education Qualification – 10+2 passed with diploma in physio therapist from a recognised board or university. Age Limit – 18-23 Years. 21. Trade – Laboratory Assistant (For Male candidates only), Initial Rank – Rifleman, Education Qualification – 10th class pass with English, Maths, Science and Biology from a recognised Board. Age Limit – 18-23 Years. (c) Possessing the qualifications under Section 31 and 32 of the Pharmacy Act, 1948 and registered under Section 33 of the said Act. Age Limit – 20-25 Years. 23. Trade – X-Ray Assistant (For Male candidates only), Initial Rank – Havildar, Education Qualification – 10+2 pass with diploma in Radiology from a recognised Board or University. Age Limit – 18-23 Years. field. Age Limit – 21-23 Years. 25. Trade – Female Attendant / Aya (For Female candidates only), Initial Rank – Rifleman, Education Qualification – 10th class pass from a recognised Board. Age Limit – 18-25 Years. 26. Trade – Female Safai (For Female candidates only) Initial Rank – Rifleman, Education Qualification – 10th class pass from a recognised Board. Age Limit – 18-25 Years. 27. Trade – Cook (For Male candidates only) Initial Rank – Rifleman, Education Qualification – 10th class pass from a recognised Board. Age Limit – 18-23 Years. 28. Trade – Safai (For Male candidates only) Initial Rank – Rifleman, Education Qualification – 10th class pass from a recognised Board. Age Limit -18-23 Years. 29. Trade – Washerman (For Male candidates only), Initial Rank – Rifleman, Education Qualification – 10th class pass from a recognised Board. Age Limit – 18-23 Years. 30. Trade – Barber (For Male candidates only) Initial Rank – Rifleman, Education Qualification – 10th class pass from a recognised Board. Age Limit – 18-23 Years. 31. Trade – Equipment & Boot Repairer (For Male candidates only), Initial Rank – Rifleman, Education Qualification – 10th class pass from a recognised Board. Age Limit – 18- 23 Years. 32. Trade – Tailor (For Male candidates only) Initial Rank – Rifleman, Education Qualification – 10th class pass from a recognised Board. Age Limit – 18-23 Years. 33. Trade – Carpenter (For Male candidates only), Initial Rank – Rifleman, Education Qualification – 10th class pass from a recognised Board. Age Limit – 18-23 Years. Age Relaxation Upper age relaxation for Genera/OBC is five years and for SC/ST candidates is Ten years. Players who have participated in any International competition/ National Competition/ Inter University Tournament/ National Sports/ Games for School/ Physical Efficiency Drive. 3. International Competition: Secretary of the International Federation of Game Concerned. 4. National Competition: Secretary of the National Federation or Secretary of the State Association of the game concerned. 5. Inter University Tournament: Dean of the Sports or other officer in overall charge of the sports of the university concerned. 7. Physical Efficiency Drive: Secretary or other officer in overall charge of Physical Efficiency in the Ministry of Education and Social Welfare Government of India. 8. Application Fee: The General/OBC category candidates have to pay Rs 100/- in the Form of Indian Postal Order (IPO). 9. Exemption of Fee: SC/ST and women candidates are exempted for payment of Examination Fee. 10. Mode of Payment/ in Favour: Indian Postal Order (IPO) should be prepared in favour of “Recruiting Branch, HQ, DGAR, Shillong 793010. 11. Submission of Application: Application as per format duly completed in all respect will be sent to “DIRECTORATE GENERAL OF ASSAM RIFLES (RECRUITMENT BNRANCH, LAITKOR, SHILLONG, MEGHALAYA 793010. Note: APPLICATION FOR RECRUITMENT, should be written in Bold Capital letter on the Top of the Envelop. 12. Enclosures of Document: All candidates are required to attach the photocopy of the following documents alongwith the application form. Copy of Sports Certificates/Achievement Certificate. Copy of SC/ST/OBC certificate as per format given in advertisement. Indian Postal Order for Rs 100/-. 13. Documentation: All candidates will have to ;go through documentation, in which all candidates have to produced all Original Documents/Certificates pertaing to age education, case, sports achieves (National/International) proof to avail age relaxation etc, the details are given in application form to Board, Failing which the candidate will be disqualified. 14. Appeal Against Physical Standard Test: Candidates who declared disqualified in Physical Standard Test (PST) may refer an appeal to the concerned authority at recruitment site for remeasurement of Height and Chest. The appeal of the candidate shall be desposed off on the same day by the appellate authority. 15. Weight: Weight of the candidate should be proportionate to height and age. 16. Medical Examination Test: The candidates must not have knock-knee, flat foot, varicose veins, squint in eyes and they should possess high colour vision. The candidates will be tested for colour vision by ISIHARA’s test as well as Edrich-Green Lantern test. Candidates must be in good mental and bodily health and free from any physical defect likely to interfere with the efficient performance of their duties. 10. 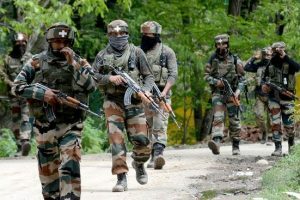 Permissibility of Tattoo: Being a secular country, the religious sentiments of our countrymen are to be respected and thus tattoos depicting religious symbol or figure and the name, as followed in India army, are to be permitted. only LEFT forearm, being non saluting limb or dorsum of the hands are to be allowed. (b) Size: Size must be less than ¼ of the particular part (Elbow or Hand) of the body. 17. Medical Review Against Medical Examination: If a candidate is declared unfit in the detailed medical examination, the grounds for rejection will be communicated to him/her by the Chairman. If the rejected candidate is not satisfied with the findings of the Medical Officer, he/she will obtain Form-1, 2 & 3 from the Chairman Recruitment Board concerned to prefer an appeal for Review Medical Examination within 15 days from the date of issue of communication in which the findings of the Medical Officers is communicated to him/her. right to any candidate for final appointment in Government service. 18. 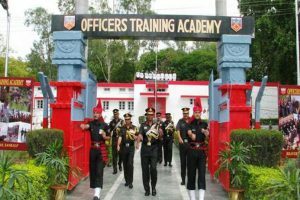 Final Selection in Assam Rifles: Final Section will be done on the basis of Field Trials and Achievement by the Assam Rifles Recruiting Authorities. Only eligible candidates may apply in the prescribed Performa. 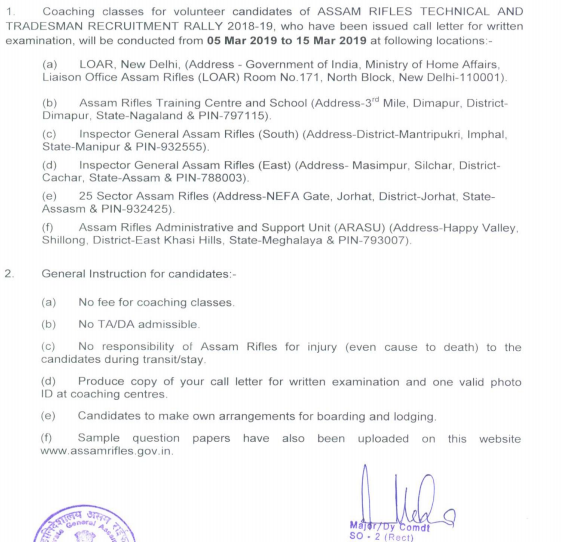 Candidates should minutely go through all the provisions in the notification to ensure that he/she is eligible for the post for which he/she is applying for Assam Rifles. Candidates should bring all original documents i.e. matriculation pass certificate, sports achievements certificates etc. alongwith self attested Photostat copies of the same at the time of documentation, failing which candidates will be rejected in the documentation stage of recruitment of Assam Rifles. Name, Father’s Name, Mother’s Name & Date of Birth should be mentioned exactly as recorded in Matriculation certificate. In case of change the same must be supported by necessary documents otherwise the candidature will be rejected. The application form must be filled carefully and signed by the candidate in his/her own handwriting. Correction, if any, should be legible and attested by the candidate. 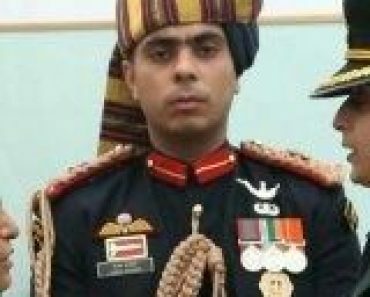 Assam Rifles will not be responsible for postal delays. Persons employed in Government/Semi Government/Public Sector Undertakings should apply through proper channel. No objection certificate from their employer will be required to be submitted at the time of documentation. Falsification of documents to mislead the Recruitment board or to gain access to examination would lead to criminal/ debar action against the candidate, besides cancellation of his/her candidature. The Government/Assam Rifles shall not be responsible for damage/injury/death/loss to the individual, if any, sustained during the entire recruitment process/journey. The Director General, Assam Rifles has full right to make changes/cancel/postpone the recruitment without assigning any reason. Candidates canvassing in any form/bringing outside influence/pressure/ offering illegal gratification/ blackmailing/ threatening to blackmail any person connected with recruitment will be disqualified by the Recruitment board Assam Rifles. It should, however, be clearly understood that the Recruitment Board reserves to itself, absolute discretion to reject or accept any candidate at any stage. Mere qualifying all the prescribed tests in Assam Rifles recruitment does not confer the right to any candidate for selection. Change in category will not be entertained in future and the candidature of such candidate shall be cancelled. Candidates who are not in possession of certificate of minimum education qualification by closing date of receipt of applications i.e. 30 (thirty) days from the date of publication of this advertisement in the Employment News need not apply. The candidates will not be considered for recruitment if involved/ convicted/arrested in any criminal case under IPC or any other Act of the Central Government or State Government. Any sportsperson, if found using banned Drugs at any point of time would be liable to disciplinary action as per Rules/regulations circulated by NADA from time to time and as per SSB Act and Rules. 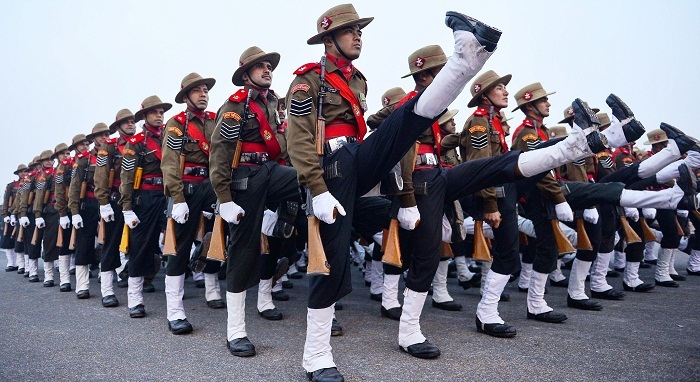 Assam Rifles state wise recruitment rally bharti program online, exam, physical, medical, result, date sheet AR Bharti 2019-2020. 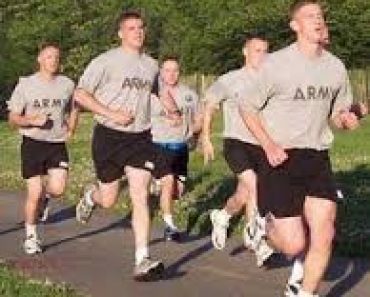 Search link: Assam Rifles army bharti rally chart 2019-2020. army recruitment rally bharti AR army rally notification date, date of online application form, date of admit card, date of physical test, date of PFT, date of PST, documents required, date of medical test, date of written test, written exam syllabus, date of AR exam result, list of districts army rally bharti AR. Assam Rifles army bharti rally notice. Assam Rifles open rally bharti, relation, sportsman, DSC, TA army recruitment rally bharti . 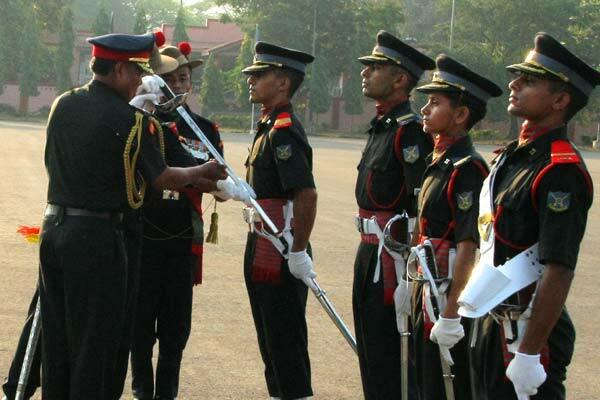 Sainya bharti AR, Assam Rifles lashkari bharti. Assam Rifles army bharti date sheet. Assam Rifles Army Recruitment Rally Bharti soldier technical/ non technical. Hello Aslam, Wait for Assam Rifles army bharti. sir es post ke bihar vale bi apply kar sakte hai kya. plz reply me. 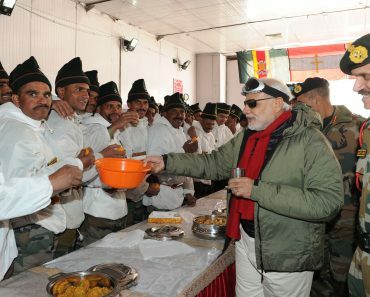 Hello Rahul, visit on “All India Army Open Rally Bharti Program 2018-2019” for complete information. Kickboxing is in assam rifles ??? Hello Ranjeet, Check your eligibility on the post and apply. 9638131963 SIR I AM JONIG FOR ASSAM R. SO CALL ME………………………. Hello Aditya, Write clear, aap kya janana chahte hain. 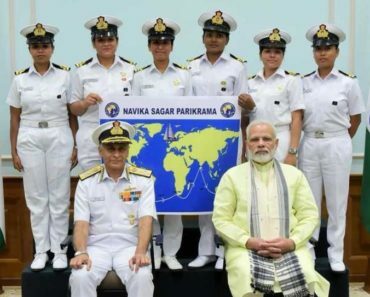 Hello, sir kya aabi laikor shillong ma female ka bharti kula hai. Plc reply me age group. Hello Milan visit on “SSC GD Constable bharti kikali” for complete information. I am joining the defence. Hello Bikash, You are most welcome. Hello Deepak, aap ke admit card par diya jayega. Taiyari karo. Hello Hanuman, please read the post carefully and take action accordingly. Hello Sandeep, visit on “TA Bharti 2019-2020 jobinfoguru” for complete TA bharti information. Hello Vishal, Thank you very much. Hello Lokesh, wish you all the best. Hello Mohit, timing me koi chhoot nahi milti hai. Hello Rup, please read the post. Hello Jatav, wish you all the best. Hello Akash, Please visit on “Army bharti program 2019” for more information. Sir sports balo ka bhi trade test or ctificat liya jayega..
Sir m abi 17year6month ka hu to m Assam rifles 2019 bharti jo hall hi m Ai h usmai ja sakta hu? Sir meri age 17year6month h kya m April 2019ki bharti m ja sakta hu? Hello Kiran, Please check the vacancy of post in the notification. Please sir help me for this m ready to die for my country my wish is to sacrifice my life for the country. Please read the post and apply as per eligibility. wish you all the best. Hello sir my self Deepa im lookng for a job in army ma qualification in 12 pass i relly want too be and army it ma wish sir please help me..